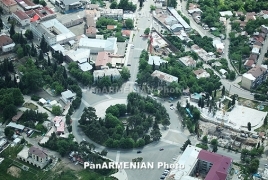 PanARMENIAN.Net - The Argentine National University of La Plata (UNLP) hosted the conference "Democracy and human rights in unrecognized independences: The Republic of Artsakh" on Thursday, August 30, Agencia Prensa Armenia reports. The Ambassador of Armenia in Argentina Ester Mkrtumyan gave an extensive conference presented by the leadership of the university. The event was held in the framework of the "Month of Armenian Culture in La Plata" and the 10th anniversary of the Free Chair of Armenian Ideas. Mkrtumyan, who was declared a guest of honor by the city authorities, made a historical review of the Republic of Artsakh and remarked that the request to the Soviet Union to transfer the jurisdiction of Azerbaijan to Armenia by the population in February of 1988 caused an "irrational violence of the authorities and the fanatical hordes of Azerbaijan, which turned against the Armenian population of the country". "Over the past 20 years, Azerbaijan has been developing an arms plan aimed primarily at reaching a military solution to the conflict, and on the other hand, its society has been poisoned by a systematic plan of armenophobia, which is taught from primary school," denounced the diplomat. In that sense, she said that in Artsaj "the institutions are every day more and more consolidated, the education and health system is perfected, the market freedom is bearing fruit with the participation of foreign companies and Armenian capitals of the diaspora and infrastructure improvements are made with the participation of nationals from all over the world. The country is being managed by a generation that is around thirty years old and that has practically no record of the Soviet regime or of the restrictions imposed by the ethnic totalitarianism of Azerbaijan."